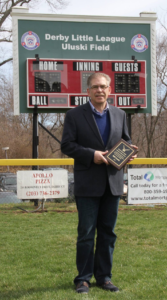 Opening Day ceremonies 2016, Richard Uluski poses before our scoreboard bearing his namesake after accepting a Volunteer Hall of Fame plaque on behalf of his late father, Bill Uluski. Uluski Field was named after Bill Uluski, whose endless dedication and timeless contributions to Derby Little League for more than 40 years earned him the honor of dedicating our Major League field in his name in 1984. Additionally, Bill Uluski was named the District 3 Little League Volunteer of the Year in 1991. The Uluski name will forever be synonymous with the strong spirit of volunteerism and pride in Derby Little League.